With one of the largest and best equipped moulding shops in operation with over thirty moulding machines, and up to 750 tonnes, it is no coincidence our company has built such a highly regarded reputation for supplying quality tooling. 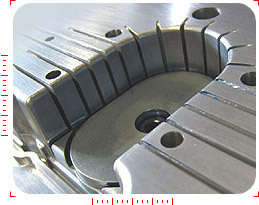 Consistent high volume orders often dictate comparable quality tooling, sometimes with extraordinary complexity. Our engineers source tools for customers locally or from overseas. We have a Colson associate in China that specialises in the manufacture of mould tools with world class quality and competitive prices. The close working relationship allows engineers at Aldridge Plastics to effectively treat the facility as an extension of its own capabilities providing our customers with competitive prices and the security in knowing that they are dealing with one supplier in the UK. Our service doesnt stop there either, as our engineers will also undertake the project management of the tooling requirements for those customers that have identified their preferred toolmakers. Maintenance: Tools are meticulously maintained in our in-house tool room to prolong their productive life and to support our single minute exchange of dies philosophy. All designated tools are cleaned after every run.